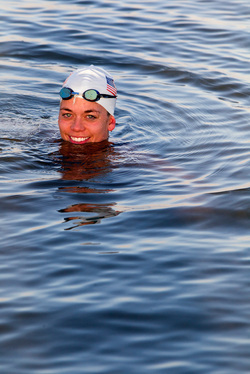 Mallory Mead is an audacious swimmer with an impressive resume. My bid at the Ocean's Seven is on hold for awhile. With a price tag of around $8-10K per swim and five swims to go, money is the limiting factor at the moment. With the economy like it is, there is very little available for sponsorships. However, with every disappointment another opportunity presents itself. Next year I will begin competing on the FINA Open Water Grand Prix circuit (professional races over 10K). With races such as Capri-Napoli Marathon Swim in Italy, Lake Ohrid in Macedonia, Lac St. Jean in Canada, and Hernandarias-Panera in Argentina, it is really an amazing "back-up plan." I'm still waiting for the 2012 race calendar to be released, so I'm not sure which races I will be competing in. No matter which one(s), I'm in for an amazing adventure in 2012. - What are you doing to prepare for Slam The Dam Open Water Swim? Right now I'm training around 45-50k a week, mostly in the pool and in chunks of 4-6k (doubles 2-3 times a week). Much of this is on my own, especially my aerobic work. However, 1-3 times a week I'm swimming with a "Power Group" of SoCal swimmers, including the amazing Alex Kostich, which is mostly threshold and overload training. I had a few tough months this summer where I had back to back injuries due to training, and its taken me awhile to come back from that. However, the last month I've been feeling strong and I'm really starting to hit my groove. - Do you plan to go all out or use this as a training day for any upcoming swims? I almost always go all out when I race. I think experience is key in open water and I think the best experience comes from trying your best! However, a more fitting question might be "Are you going to taper?" I will be swimming in the first ever Swim Around Charleston at the end of October which I will be tapering for, so no, I will not be tapered. This swim is a unique opportunity to play around with race strategy. I'm swimming the Grand Slam, so not only will I be swimming the 8k, but also the 1.2 mile! My best distance is 10miles and above, so both races are a bit "sprinty" for me. I think that the combination distances and the amount of speed I'll have to put in this will in many ways make this a more challenging endeavor for me than a marathon. I haven't quite figured out my strategy for each individual distance, whether I will back off on one to save energy for the other, etc. I am big on gaining experience and working on my weaknesses so I am very excited, however, I am anticipating a lot of pain! - What words of advice do you have for swimmers who are competing for the first time in open water? My best advice is to challenge yourself! When I was 18 years old I did my first marathon swim, the 28.5 mile Manhattan Island Marathon Swim, when my longest race before that day had been a 7.8 mile with a current assist! My greatest asset has always been that I never shy away from a challenge, and I go into swims with an almost ignorant confidence. The possibility of failure never really occurs to me, and with a rock solid mental state like that, failure is really unlikely to happen!That being said, preparing yourself physically is also really important, and if you are physically prepared you will have the added benefit of also being even more mentally prepared! -You've also been making a name for yourself as an open water coach, haven't you? While coaching wasn't always what I imagined myself doing, I keep getting pulled into it. I have to admit, it isn't a bad life! Right now I'm coaching Master's as well as a kid's pre-competitive team, and I love it! My favorite though is the open water clinics and boot camps I've been developing as a coach for Southern California Aquatics. I get paid to introduce swimmers and triathletes to the ocean, teach racing skills, and my bosses and clients are very accepting of my swimming "habit." I am very fortunate to be completely surrounded by the sport I love so much!In February I will be working with Costa Rica Dream Swim Camps to offer a week-long open water swim camp in Guanacaste, Costa Rica. It's the first open water camp offered by CSDC, and it will be an absolutely perfect week of training, skill building, relaxation, and sight seeing, culminating in a open water race. It will be the perfect cure for the winter pool-training blues! Will she be the first woman to win the Grand Slam at Slam The Dam?